Work Better, Not Harder: Show Off Your Blog Post Dates! This recent tweet by Scott Stratten provoked an immediate reaction from me. I get totally annoyed with blog posts that have no published date. I'm reading away merrily and then a reference to something outdated comes up, seemingly out of context. I look for a date - none to be found. So now I'm thinking, "Why doesn't this person want me to know when they wrote it?" 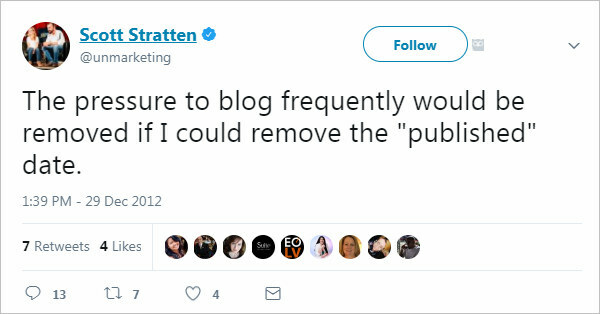 Is it because they hardly ever blog? Is this the one and only article they've ever published? You get it... I'm immediately questioning their credibility. Scott seems to be alluding to this same credibility issue in his humourous way. I feel that pressure, too, when a couple of weeks slide by without writing anything. These are kind of important reasons - many a misunderstanding has occurred over a missing date.